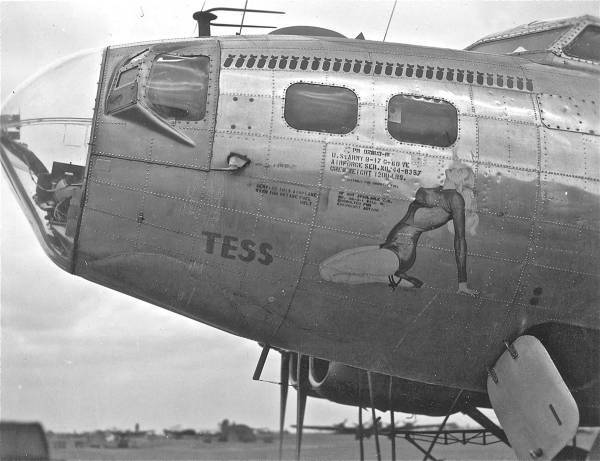 Delivered Dallas 17/8/44; Keesler 9/9/44; Grenier 12/10/44; Assigned 401BS/91BG [LL-M] Bassingbourn 5/11/44 TENNESSEE TESS; transferred 30+m 306BG Thurleigh 1/5/45; Salvaged 9AF Germany 24/6/46. TESS. My wife’s uncle Robert E. Hardister, Jr. flew this bird out of Bassingbourn, England. He and his crew are shown with Tess in “The Ragged Irregulars Of Bassingbourn” PN&M page 143. I’ve done research over the years hoping to find an 8X10 glossy of that photo but have not been successful. Sadly, I never got to talk with him before he passed.